Posted on December 27, 2008 at 3:49 am, under asian pop. Posted on December 22, 2008 at 8:59 am, under asian pop, film/television. You can also tell I’m gonna be all over this because I can already feel the Lee Minho/Gu Hye Sun shippy vibes coming. I’m not sure how the two actor’s chemistry is going to be, but if it’s anything like it looks like from the first few pictures, I wouldn’t worry. They’re also two good actors in their own right so this shouldn’t be too hard. I hope. Gu Hye Sun’s dress looks like something AWFUL. I refuse to believe that the designer of the dress actually attached that green Christmas wreath onto the final product; in my head, a stylist decided to be stupid for the day. But otherwise, she looks really lovely and while the outfit is a tad boring, it’s press-conference ready. Lee Minho’s hair adds like 6 inches to his height, but I’ll cut him some slack because the hair is something crucial to his character, lol. This is a fine looking cast and I wish Kim Bum were given a bigger role (I wouldn’t mind, actually, if he ended up playing Rui and Hyunjoong was not in this at all). Posted on December 22, 2008 at 8:14 am, under fashion. I got put-off from runway fashion a while ago because while it was really nice being in “the know” of all the fashion happenings in the industry, I felt a disconnect. Never say never, but I didn’t feel like I was going to be able to afford all those runway looks any time soon. Runway looks are supposed to “inspire” you to dress a certain way but I just felt like there was no reason a dress was celebrated for being Chloe, or Zac Posen, or Chanel or Louis Vuitton just because they were Chloe, Posen, Chanel, or Vuitton. I also believe that some people are so hopped up over these labels and the names on the labels that they’re not looking at the clothing for the clothing, but rather, attaching some sort of divinity to the clothing because of the maker. And that bothers me because I think that 50% of the stuff that comes down from runways are not wearable or practical, yet celebrated for reasons that are way beyond me. So it’s really nice when I see shots of non-models in their own clothing. When I see outfits like that, I can say “Oh! I have something similar in my closet!” and while I don’t mean to just copy an outfit from someone you see, it’s nice to still remember that fashion is about starting from what you have in your own closet and not looking at a potential wardrobe of someone else’s closet. Posted on December 20, 2008 at 1:47 am, under asian pop, film/television. I think I can safely say that the only thing Kpop has going on for it right now is the upcoming Korean version of “Hana Yori Dango.” The Kpop music scene is getting stale and the pretty boys are passé. I am confident in my confidence because everybody who has watched Hana Yori Dango (a lot of people) has some sort of feeling towards it–hate, love, annoyance, sheer obsession– and these sort of feelings are exactly what Korean producers are banking on so that they can draw in a new audience for their own remake. First of all, when was there a beach? When did they go to Venice?? What the eff? I realize that the Korean version is 24 episodes long and this gives it enough episodes to cover ALL of Japan’s season 1 AND 2 AND the movie version, but come on — I think this is going just a tiny bit off base . . .
Second, Hyunjoong and Hye Sun’s kiss scene looks like something uncomfortable and horribly scripted. I worry for Hyunjoong, that emotionless piece of rock. Third, the guy who plays Domyouji (something Min Ho? ), I watched him in a movie with Kim Soo Ro and he was AWESOME. I can tell he’s gonna be the better Domyouji compared to Matsujun’s greaseball booger-pickin’ pimp of a Domyouji. Everything about this version seems to be too pretty and I worry about that but we’ve never actually seen the school stuff yet, which they seemed to not have shot, given all their traveling to the Europe lands and New Zealand lands, so hopefully, you know, the MEAT of the story is still good. For all my ranty-ness, I’m hella excited for this version and will definitely keep up with it once it comes out. Posted on December 19, 2008 at 4:37 am, under lifestyle. 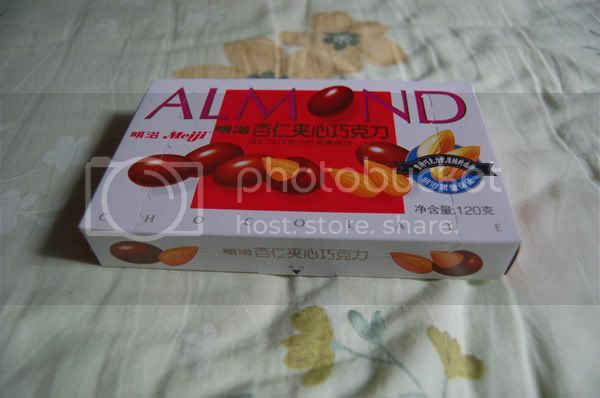 Ever since the minor Pepero binge from a few days ago, I’ve been craving more chocolate & almond-y goodness. Naturally, went food shopping today. 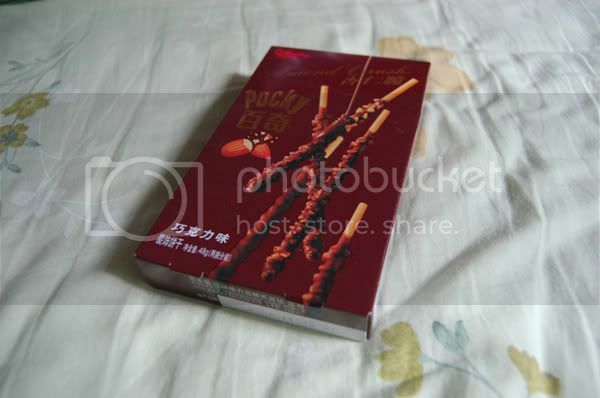 This is Pocky’s version of the Almond + chocolate-covered biscuit thing. 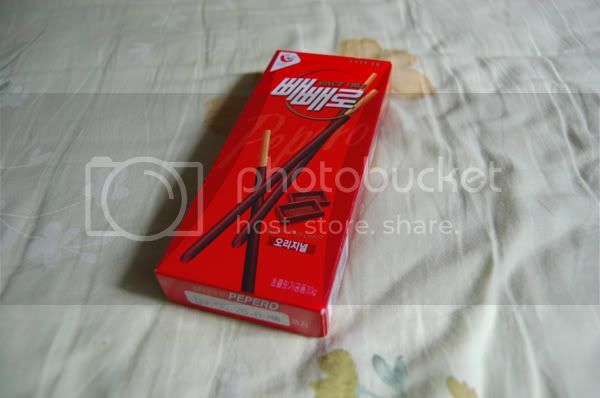 It’s a lot sweeter than Pepero’s version. I don’t like it as much. Not really almond-y, but still, I needed more chocolate.